Ashford is 11 months old, and so full of personality! He is still a peanut at about 19 pounds. 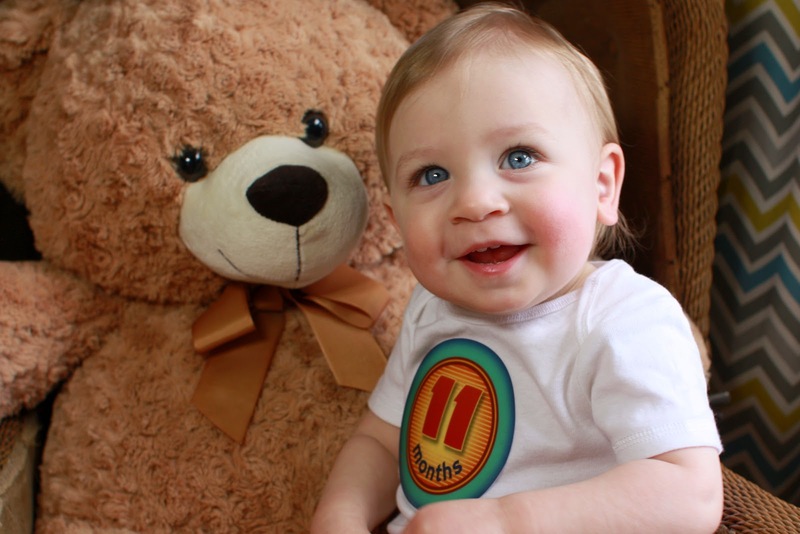 He still wears mostly 9 month clothes. I attribute his slender frame to his refusal to eat most things - yes, that is still going on. It is my biggest worry. Maybe if they made wood-flavored baby food, he would be happier. 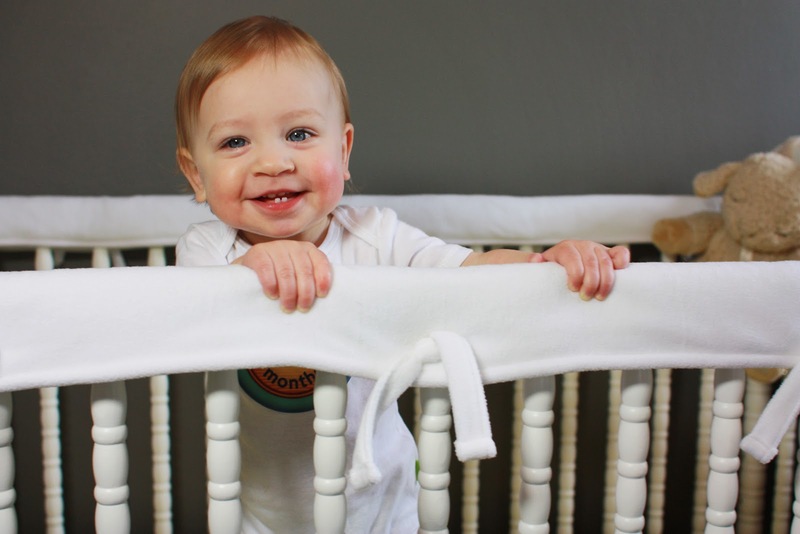 He gnawed a hole in both sides of his top crib rail, so that is awesome. He is just starting to walk, when he's not thinking too hard about it, he will walk for several steps before falling, so I think he just has stage fright. He still has regular meltdowns, but in the last week or so he's been healthy (we think he has allergies like me) and a total joy to be around. He doesn't appreciate my non-smart phone, though. I've been completely obsessed with taking photos of him. I'm not sure what my deal is, but I bring my camera on every walk, every time we step out in the yard, I have it for every bath, it's ridiculous. I've been trying to take photos that aren't your standard pose, so when he doesn't look at me or gets too close to the camera, I take a photo anyway. Sometimes you get great photos. And you may wonder, what is he smiling at out of the frame? Or, is there a spider about to fall on my head? So, we've been having fun. The kid loves swim lessons, climbing stairs, and chasing the cats. He also loves taking walks in the stroller and 'dancing' with us. He is warming up to books, which gives me immense relief. He used to just hit them, throw them, try to eat them....I had visions of him never reading because I failed to get him into it when he was a baby, so YAY! In a couple weeks he will be one. I hear that is a big birthday, so I'm about 7 days away from freaking out and doing everything last minute. Guess I will just relax until then! He's growing so fast!! Love the photos - I really need to up my game! What a beautiful boy he is! :) Time just flies way too fast... doesn't it? Don't worry about the book thing - it took my daughter til around 15 months to "read" a book. She would just throw them, and now (at 23 months) you can't keep her away from them. Her daycare carers often comment how they will lose Eliza and find her crouched in the reading corner with a stack of books. He is such a handsome little man. These pictures are precious. He is such a cutie!! Our peanut just started walking in the last 2 weeks and it is so adorable to watch - and total destruction for the house. :) Happy almost birthday, Ashford! He's such a cutie! I swear, he and Theron would be great buds! Theron, too, just started liking books and i about peed myseld--ha. Relieved is an understatement. he looks a lot like his dad. He's a happy baby! So sweet :) The 1st year flies by huh? I feel like you just had him! He's getting so big! He is such a cutie. And I love it because he and Henry are so much alike. Henry still prefers to eat books, and I freak out a little about it. I really want him to LOVE BOOKS. But, he's actually let me read him a few books lately, so there's hope. He is so darn handsome!! Also, I just love that chevron blanket that he sits in front of in his little photos :). Too cute. I love your baby updates! He's so long/tall! I have a 10 month old boy and he just started crawling a few weeks ago... looks like your baby will be running by his first birthday! 3. I can't believe he's almost 1!! 4. Our Jenny Lind also has teeth gouges in it. Determined little buggers. 5. The fact that he's starting to take an interest in books now is AWESOME!! It's such a fun time. Quinn's 'reading' entails maniacally flipping thru the pages, tossing the book over her shoulder, & moving on to the next big thing (tipping over the trash can). I'll take it. All this to say, whatever you're doing w/ Ashford--keep on doing it. He's the sh!t.